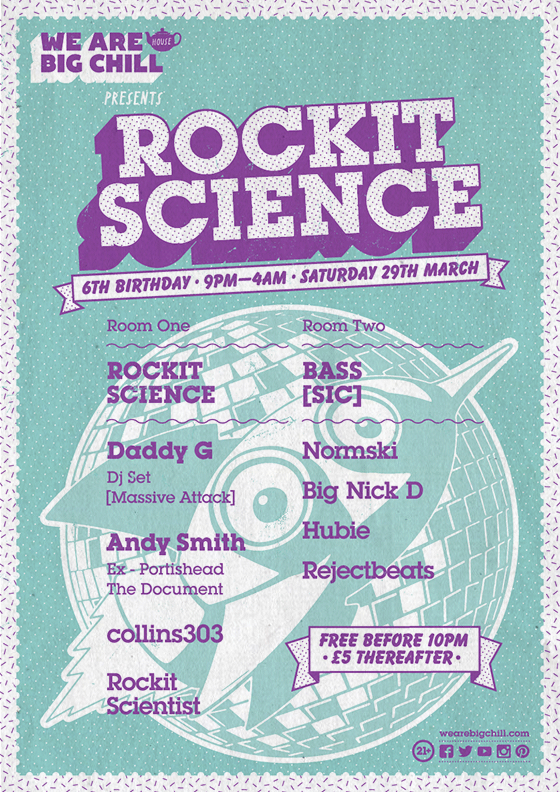 Bass[sic] is proudly hosting the second room at the illustrious Rockit Science 6th Birthday Party at the Big Chill House, London, this Saturday 29th March! 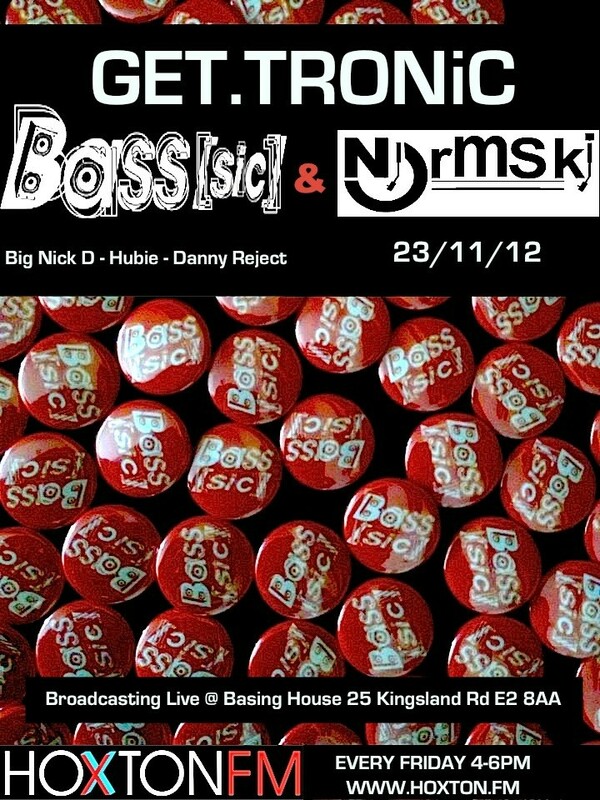 Special guest DJs on the night will be Daddy G (Massive Attack), Andy Smith (ex-Portishead) and Normski (GetTronic). The ever reliable Rockit Science residents Collins303 and DJ Ryu will also be laying down beats in the main room, whilst your favourite Bass[sic] residents rejectbeats, Big Nick D and Hubie will be joining Normski on the ones and twos upstairs. The party kicks off at 9pm and runs through to the wee small hours. Entry is FREE before 10pm and only a fiver thereafter, so we suggest you get down nice and early to guarantee a spot on the dancefloor! Check out the cracking video-flyer above to help give you a flavour of what to expect! Make sure you check out the event page on Facebook too! Free Music & Fun Stuff! Next up, here’s a recent Document promo mix from Andy Smith, which is full of funky nuggets! Check it out on Andy’s Mixcloud. Rockit Science supremo and resident DJ Ryu has also put together a funktacular promo mix, which you can stream on Mixcloud! And once again, our very own resident DJ Hubie has dedicated his latest Hubie Sounds radio show to promoting the party with a selection of bassy beats, plus a focus on Massive Attack, where Hubie spins a bunch of classic tunes from the Bristolian trip hoppers’ rich back catalogue. Finally, don’t forget to check out the Bass[sic] Mixcloud for loads of free mixes that you can stream and download ’til your heart’s content! Right, that’s it. See ya at the Big Chill House this Saturday! Don’t forget to pop up to the Bass[sic] room and say hello! All Set For The Bass[sic] All-Nighter? Ok gang, are you all set for the big party this Friday night? We’re getting very excited! 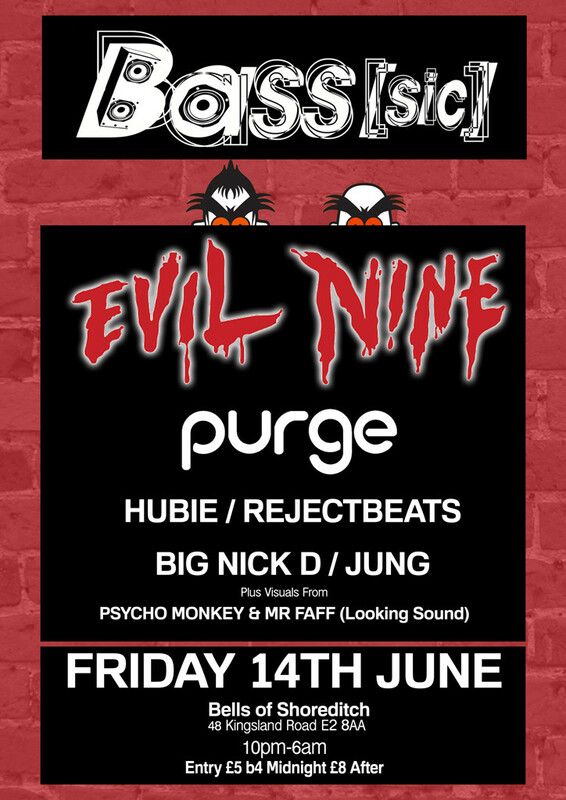 In case you’ve missed the news, Bass[sic] is returning to Bells Of Shoreditch, East London, this Friday 14th June for a massive bass music all nighter, with extra special guest DJs Evil Nine making an all-too rare London appearance, supported by hot new talents Purge and Jung and the ever-reliable resident DJs – Hubie, Rejectbeats and Big Nick D – giving you a whopping eight hours of bass music bliss! The party kicks off at 10pm and it’s only £5 on the door (£8 after midnight), so at those cheap prices you’d better make sure you get down nice and early to reserve your spot on the dancefloor. It’s gonna be smashing! You can also check out the party info on Facebook! Of course we also have the official warm up for the party, The Bass[sic] Session, provided by resident DJ Hubie on his Hubie Sounds show on NSB Radio. This time around Hubie was joined in the studio by fellow-Bass[sic] team-member Big Nick D who laid down a set of his typically excellent tech-housey business. You can check out the show right HERE! And finally… don’t forget to check out our Mixcloud where you can find loads of exclusive mixes and live sets to stream and download, of course all for free. Hi gang! We’re pleased to announce the details of our next big party taking place on Friday 14th June, once again at the Bells Of Shoreditch in East London. This time around we’ve got a late 6am licence and some proper legends headlining in the form of macabre beatsmiths Evil Nine, making a rare London appearance with their unique combination of electro, beats and bass. Also on the decks we have one of the biggest talents bubbling under in London clubland at the moment, Purge. And completing the lineup we have a proper party starter in Jung, as well as our ever reliable residents Hubie, Rejectbeats and Big Nick D.
We’re also pleased to welcome back the VJ stylings of Psychomonkey and Mr Faff. EVIL NINE [For Lovers] – Brighton-based duo Evil Nine (or Pat Pardy and Tom Beaufoy to their respective mums) have been producing dark, twisted beats for 14 years now. Their early days signed to Adam Freeland’s trail blazing Marine Parade stable saw them produce one of the great debut dance music albums in You Can Be Special Too – a truly unique collection of macabre beats and basslines, tied together with some of the most talented rhymers the underground hip hop scene had to offer. This record, as well as a raft of excellent singles and remixes, led to the duo becoming one of the hottest properties in underground dance music. They have since produced a second album, the zombie-themed They Live and they are currently working on a third long-player, due to hit later this year on their own label, For Lovers. PURGE [Nasty FM] – Also sharing this exciting lineup is one of the hottest up-and-coming talents of London’s underground bass music scene, Purge. Having rubbed shoulders with the superstars of the infamous Fabric nightclub, Purge has gone on to become a special talent in his own right, spinning an up front selection of the finest bass music, garage and house to packed dancefloors all over the UK and Europe. Purge is no stranger to the world of underground radio too, hosting his own show on Marcus Nasty’s Nasty FM. He’s also been busy in the studio, working on his debut EP Sandstorm, due to hit this summer on Berlin’s ITAKA. JUNG [Bass Ache] – We’re also proud to announce a third special guest, the very talented Jung. 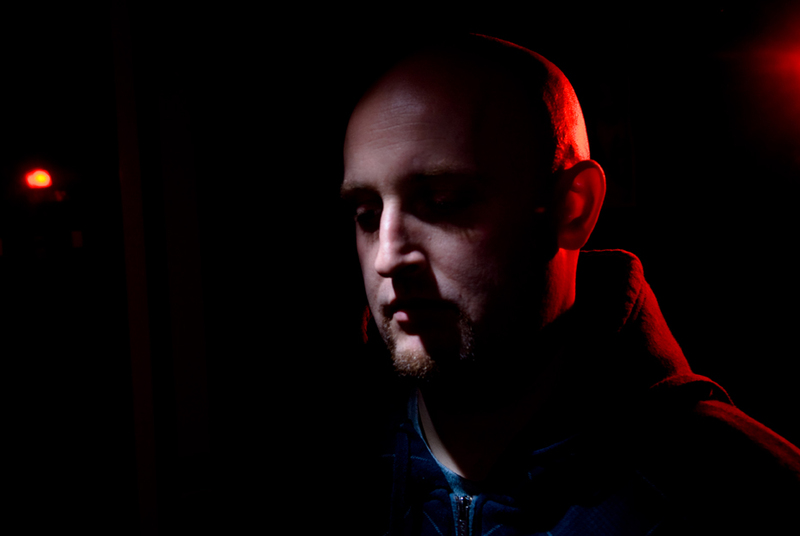 Also known as Stacey McDonald, he has played for Chew The Fat at the legendary End nightclub, warming up for the likes of The Rogue Element, and will bring his unique blend of fresh bass music and classic breaks and jungle to the decks for a rare and exciting London appearance. Keep an eye on this website for further announcements plus more fun features, interviews and music in the lead up to the big event. As a further part of our 1st Birthday celebrations, our very own resident DJs Big Nick D, Rejectbeats and Hubie have been invited to appear on the legendary Normski‘s Get.Tronic radio show on the uber-cool Hoxton FM – broadcast live from Basing House, in the heart of Shoreditch. As we’re sure you’re aware, Normski will be one of our special guests at our 1st Birthday Party at The Cornershop this Saturday, so he kindly invited us onto his radio show to help spread the word about Bass[sic] and to drop our trademark bangers, smashers and destroyers for his lovely listeners’ ears! We hope you can tune in for what is bound to be two hours of banging tunes and witty banter… well, banging tunes anyway! Almost Time To Blow Out The Candles! Yes it’s nearly time to blow out the candles on our birthday cake, open our prezzies and get mashed up with you, our good friends! As we’re sure you’re well aware now, this Saturday we will be celebrating our 1st Birthday at The Cornershop in Shoreditch, London. And in order to celebrate properly we’ve got a late licence plus a bunch of proper party DJs – NAPT, Normski, Hedstate, plus our ever-reliable resident DJs – to bang out the celebratory anthems ’til the wee small hours. As you can imagine, we’re getting very excited! 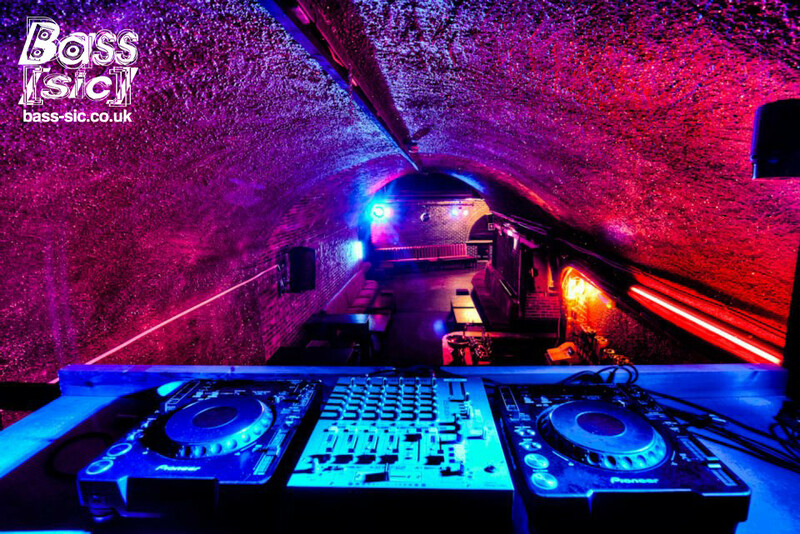 The party kicks off at 8pm and as usual it’s FREE entry all night long so make sure you get down there nice and early to make sure you get a good spot on the dancefloor! Also make sure you check out the rest of our Mixcloud where you can find loads of exclusive mixes and live sets to stream and download, of course all for free. Right, that’s yer lot! We hope we see you down the front at The Cornershop this Saturday night! Make sure you come and say hello! We just wanted to say another big thanks to all of you who came down to The Cornershop on Saturday night and helped make our third Bass[sic] party such a rawring success! 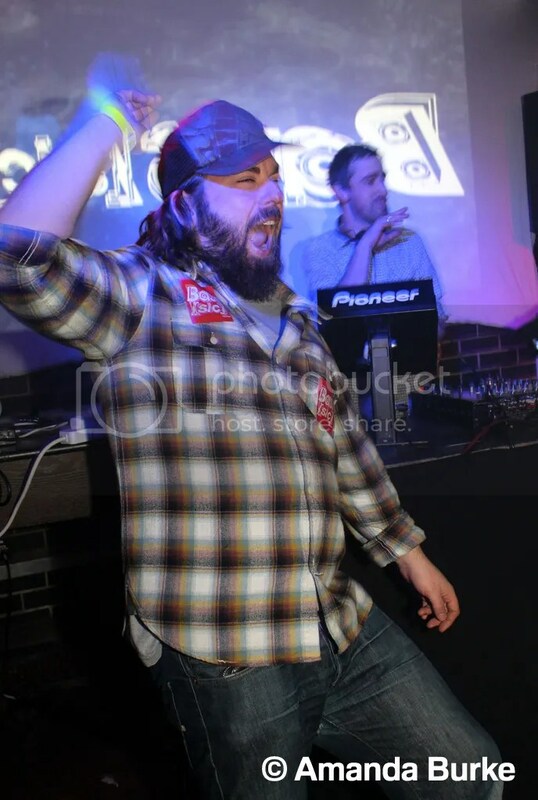 Also massive big ups to our excellent guest DJs, Mr Cut La Roc and the man-like Merka, aka Ford Audio, for absolutely smashing the place to pieces! A notable mention should also go to our ever-reliable resident DJs who, together with our guests, formed a very juicy bass music sandwich, I’m sure you’d agree! We’re still sifting through our photos from the night, they should be up very soon, so keep an eye on our Gallery page for updates. The next party is on Saturday 26th of May at The Cornershop, mark it in your diaries! Full lineup and details coming soon, watch this space! Yes that’s right, only two more sleeps ’til Bass[sic] returns to the rave cave basement at The Cornershop in Shoreditch and we’re getting very excited! This Saturday 31st of March the legendary Cut La Roc will be headlining the party with his special brand of big beats and cheeky re-rubs. And supporting him will be the man who used to be known as Merka, now in his Ford Audio guise, spinning his unique blend of chunky breaks and filthy basslines. 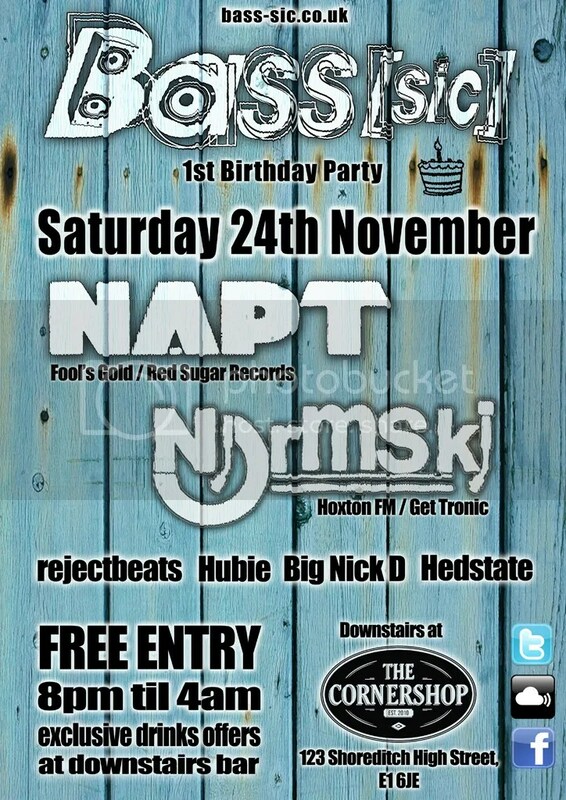 Also on DJ duties will be the ever-reliable Bass[sic] residents Hubie, Big Nick D and rejectbeats. Of course entry to the party is FREE all night. Kick off is at 8pm – we recommend you get down there nice and early cos it’s bound to get very busy and we don’t want you to miss out on all the fun! And if you haven’t been to a Bass[sic] before, here’s a video of our first party that should give you a little idea of what to expect!